NEXT Stunning sparkly gold glittery SANDALS. Size 6. High heels 3 3/4 inches . Brand new without box . From a Clean, smoke and pet free home. 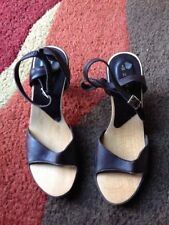 Next Womens Mid Kitten Heel Ankle Strap Sandals In Black Size 6.5 RRP€40. Dispatched with Royal Mail 2nd Class. Please have a look at my other items. Ladies pink faux suede feel sandals high heels. Size U.K. 6.5 (Eur40) from NEXT. ORIGINAL RRP £35.00. No box, just been sat in the wardrobe in storage. Brand New Without Tags Next Tan Block Heel Sandals Size 5. Condition is Used. Dispatched with Royal Mail 2nd Class. Cream trim. In good, clean condition. Cream trim. In very good, clean condition. NEXT NAVY BLUE SHOES. LEATHER CUSHIONED INSOLE FOR EXTRA COMFORT. Stunning NEXT SIZE 9 (EU43) Magenta Fushia Pink Ladies Heeled Shoes Sandals New. Condition is New with box. Very comfortable but a little too high for me in retrospect. Dispatched with Royal Mail 2nd Class. Next women’s party sandals, silver with kitten heel. Size 9 wide. Never worn. Brand new in box. Non-smoking house but 1 well behaved cat. Ladies Next Red and White Polka Dot Wedges Size 9. Condition is Used but in excellent condition. Shoes 9/43 sandals strappy NEXT heels summer/wedding . Condition is Used, I bought them second hand, wore them once for a wedding. No returns. UK ONLY. Dispatched with Royal Mail 2nd Class. Next ladies black strappy stilleto heels suede UK size5.worn twice. Next ladies black strappy stilleto heels suede UK size5.worn twice.. Condition is Used two scuffs to heels.. Dispatched with Royal Mail 2nd Class. ladies next shoes 8, never worn brand new still in box. Condition is New with defects. Dispatched with Royal Mail 2nd Class. Lovely shoes with pink lace that ties around the ankle. Worn Once Next Brown Tan Leather Block Heel Sandals. Lovely heels by NEXT * Size uk 8 Eu 42 * black, brown and beige faux leather straps * Ankle buckle fastening * 4.5” slim heel * Synthetic insole * synthetic sole * Peep toe * Slingback Heels are NEW. Never worn just tried on. Please see photos for more details. Thank you for looking. 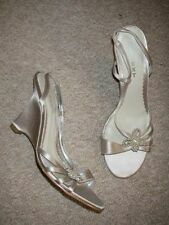 BNIB Next Sliver Strappy Shoes / Sandals - Size 5. Gorgeous pair of shoes that I bought for a wedding but ended up wearing something different. Zip fastening to the back Rrp £45 Brand New with their box. Perfect condition. Next Women's Heeled Cork Strappy Sandals UK Size 6.5 (EUR 40). Condition is New with box. Dispatched with eBay delivery – Shutl 2-3 days. Next Silver Glittery Sandals Size 6.5 BNWB. Condition is New with box. Dispatched with Royal Mail Signed For® 2nd Class. Lovely almond shaped Toes. 'Ankle Strap'. HIGH HEEL SHOES. Gorgeous chunky High Heel Shoes. Perfect Accessory ! ORIGINAL BOX cost £32. Leather insole. Next Signature Green Strappy Heels Size 6. Condition is Used. Dispatched with Royal Mail 2nd Class. These have only been worn twice. Very comfortable with medium heel and no marks or rips on them. These look great styled with your fav pair of denims! You have a chance to buy this pair of ladies shoes by Next. Next Wedges Size 40/6.5 in good condition. Thanks for looking. Please take a look at my Other items for sale. 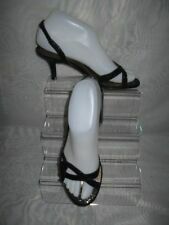 Black patent leather court style shoes size 5.5W. Buckle fastening. Approx 9cm block heel height. Ladies NEXT Sandals Gold Wedges Size 6 New In Box party . Dispatched with Royal Mail 2nd Class. Tried on several times but not worn, soles slightly dirty from walking around. Labels still attached - cost £35 new. Gorgeous Gold Shimmer Next Sandals 4.5. I wear a size 5 normally and they fit me Condition is Used. Worn once but the heel is too high for me Perfect condition Double ankle strap Dispatched with Royal Mail 2nd Class.